For years I've been looking for ways to put leftover oatmeal to good use (no matter how I try to scale down the pot of breakfast porridge, I always end up with leftovers). Then my daughter discovered a recipe for oatmeal pancakes in Kim Boyce's Good to the Grain. She's continued to tinker with the recipe, and the result is one of my very favorite breakfasts, especially good with apple butter, but perfectly tasty with maple syrup, too. I always make oatmeal with apples, cutting the fruit into small pieces now that I know the leftovers will be worked into pancakes. If you don't already have some of this cooked oatmeal on hand, see the how-to note below. In a large bowl, mix together the oat flour, all-purpose flour, sugar (if using), baking powder, and salt. In a medium bowl, whisk together the oil, milk, cooked oatmeal, and eggs. With a large spoon or spatula, gently mix the wet ingredients into the dry ingredients, stirring until just mixed together. Do not overmix the batter; gentle mixing yields tender cakes, overmixing will result in a gluey batter and tough cakes. The batter will be fairly thick and kind of loamy. Heat a large skillet over medium heat. Melt a nob of butter in the pan and spread it across the surface with a pancake turner. 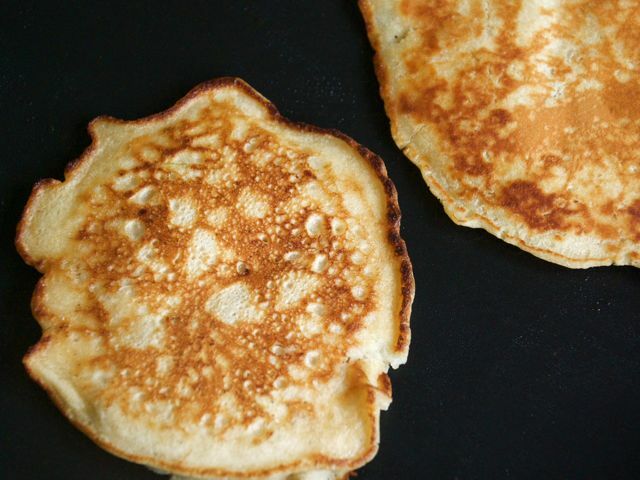 Using a quarter-cup measure, spoon the batter into the hot pan, forming pancake mounds. Once bubbles have started to form on the top of the pancakes and the edges have started to dry, flip. Cook on the other side another 2 to 3 minutes, until both sides are a lovely golden brown and crisp on the edges. Remove the pancakes from the pan and repeat the process until you have cooked as many pancakes as you like. Serve the fresh pancakes hot with apple butter and/or maple syrup. Store leftover batter in the fridge, covered; thin it with a bit of milk before cooking more pancakes. You can purchase oat flour at a natural-foods store or in the bulk or baking section of the grocery store. Store it in the freezer. If you don't have any leftover cooked oatmeal, put 2/3 cup rolled oats and 1 grated apple into a small saucepan along with a shake of cinnamon and 1 tablespoon brown sugar. Add 1 3/4 cups water and cook at a low simmer for 5 to 10 minutes, until the oats and apple are soft. Take off the heat to cool, then add to the recipe where indicated.